When a loved one or friend is arrested, family members may be overwhelmed with the situation and unsure of how to proceed. We’re here to help. As Denver, CO’s, leading bonds service we can walk you through the process with expert guidance and respect. We’ll explain your bonding options, what to expect before you can see your loved one and what you should plan for next. We have years of experience, and we’re available 24/7 when you need us. Check out our FAQ below for more information or contact us today to set up a bond. Bail is the amount of money the judge sets to allow a person to get out of jail. A bail bond is a surety bond guaranteed by a state-licensed bondsman. The bond agent guarantees full payment of the bond to the court if the defendant fails to appear in court. There are many types of bail that can pertain to your loved one’s release. These include cash bail, a typical surety bond, property bonds, cite-outs, and own recognizance. We can help you understand the type of bail the court requires and provide you with affordable payment options should you need them. How much does it cost to obtain a bail bond? A bond amount is set by a judge who decides this factor based on the charges, any prior failures to appear in court, criminal records, and community connections. 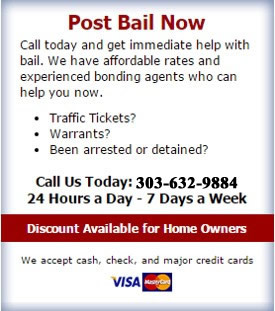 In the state of Colorado, bail bondsmen usually charge 15 percent of the bond amount, with a $50 minimum. By taking out a bond with us, you can cover the required amount needed to release your loved one without paying the full bail amount. Depending on the amount of the bond, collateral may be needed to secure the bond. Collateral usually consists of cash or real property. How long does it take to set bail? Setting or paying bail can take up to 24 hours or longer depending on how busy the jail staff is. We strive to provide quick processing of your bond, and we’ll keep you to date on any information regarding this transaction. What information do I need to bring to bond someone out? Before calling us, you’ll need to know the defendant’s full name, birth date, the charges, the bond amount, and the location of the jail they are incarcerated at. What happens if the defendant doesn’t show up to court? When this occurs, the bond goes into default and a warrant is issued for the defendant’s arrest. At this time you are at risk of losing your collateral. If the defendant is cooperative, the court may be willing to reinstate the bond. However, if necessary a fugitive recovery agent can be hired to resolve the issue and ensure the defendant returns to court as needed.